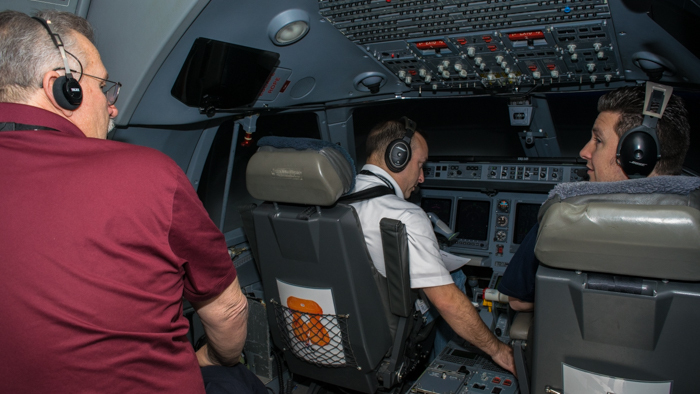 In an instant, the massive shifting and swerving Embraer 145 simulator came to a halt, the drawbridge dropped and when three pilots exited, three more entered through the sim doors. It was 10 a.m. and Professional Simulator Instructor Jim Carter was preparing his two first officers in-training for a marathon of simulator practice. 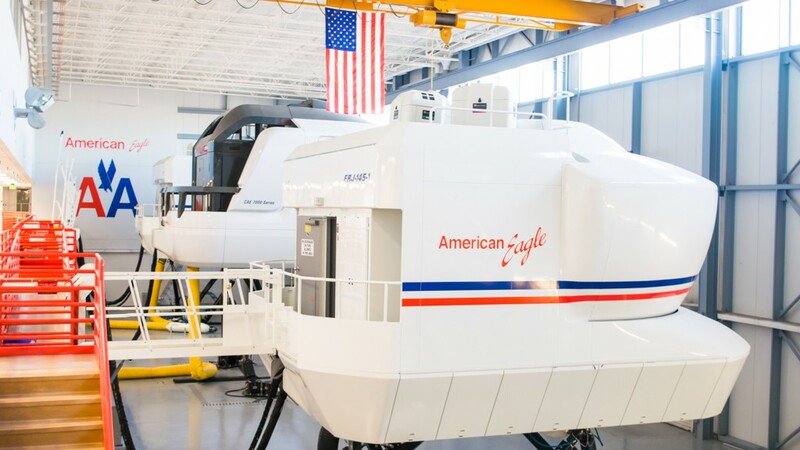 In three locations across the country (Dallas-Fort Worth, Houston and St. Louis), Professional Sim Instructors (PSIs) like Jim are helping new pilots achieve their dreams of flying for a commercial airline. They spend anywhere from six to eight hours a day going over every kind of situation and event in order to hone the trainees’ situational awareness and skills – an important part of running a safe operation. 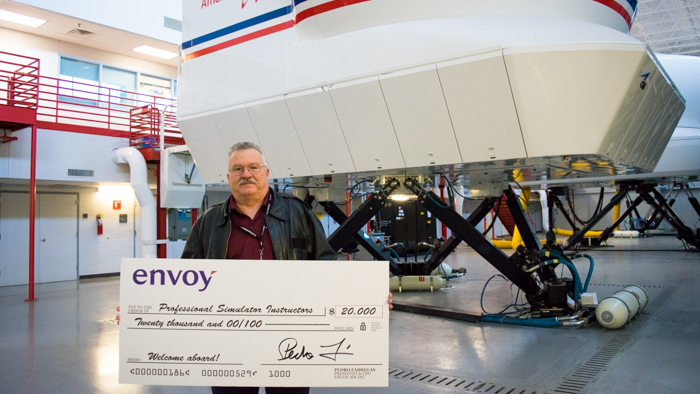 Recently, Envoy began hiring skilled aviators with a penchant for teaching – as well as awarding them with a $20 thousand sign-on bonus – to become PSIs and expertly train new-hire First Officers and upgrading Captains. Many have spent decades flying for regional and mainline airlines across the world, returning to impart their wisdom and experience with the next generation of pilots. Jim began his aviation career flying cargo and corporate aircraft before coming to Envoy (then American Eagle) in the mid-1980s. Jim flew the Saab, Jetstream and the ATR as an Initial Operating Experience instructor until 2002 when he landed in the Embraer 145. Jim retired as a part 121 pilot in 2015. But retirement didn’t last long for Jim – he was eager to get back into the aviation world and do what he’s always loved most, teaching. Jim understands the hours of work and dedication that goes into pilot training, but he said he’s “up to the challenge to make them just as good as any pilot out there.” It begins with giving them the best tools and knowledge that can be translated into action where they have to make quick and important decisions. One of his instructing tactics to aid pilots in multitasking is to have them pass a tennis ball back and forth while reciting their callouts. This gives them a bit of distraction to help them focus on the task at hand, said Jim. When they get into the sims, most trainees are ready to convert their book knowledge into action. Jim knows that, along with foundational knowledge, a lot of repetition in the sim can go a long way into perfecting trainees’ skills and decision making. But not every trainee is an Ace pilot just yet, that’s why Jim has a teaching style based on positive learning and encouragement. It takes a lot of hard work and long nights to become a successful Envoy pilot, as well as becoming a trusted instructor who can produce high-performing students. Thankfully, Envoy can offer PSIs a schedule that allows them 10 days off per month, flexible schedules and per diem.